iPieces offers you a new way of playing games together on the iPad. The classic game of Air Hockey has been brought to life with iPieces, in a way, never previously seen on iPad. iPieces are able to provide your family and friends with a unique gaming experience, by combining the traditional playing pieces in a game of Air Hockey with the animation and sound effects of the virtual world – iPieces really is able to provide you with a new generation of board game. 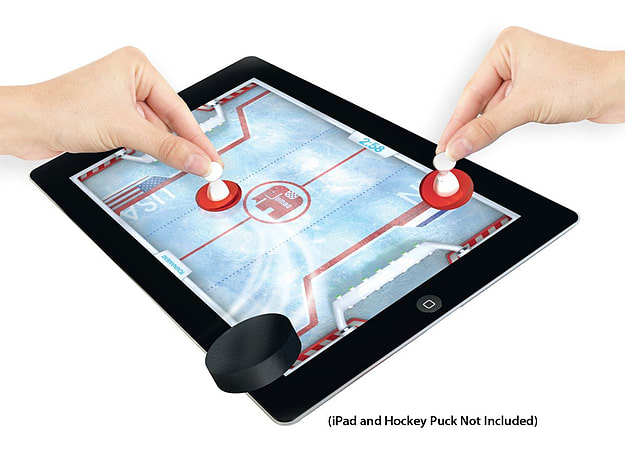 Experience the thrills and fun of playing Air Hockey by using your hockey mallet iPiece to knock the animated puck on the iPad screen. You can represent a variety of nations in an Air Hockey game as you play against friends and family. What is great about the Jumbo Air Hockey app is fantastic additions during game play – look out for bonus pucks and stay clear of the cracks in the ice because they will make you lose points. iPieces Air Hockey is suitable for 2 players and children aged 4+. The pack comes with 2 iPieces Air Hockey mallets. 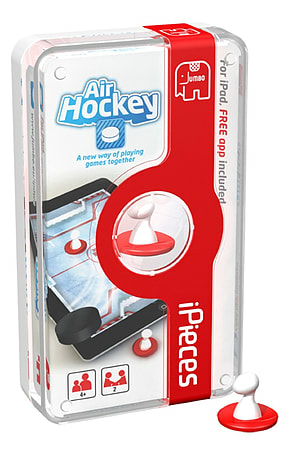 Also included with the iPieces Air Hockey is a FREE download of the game app on iTunes. As soon as you download the FREE app, you can start the fun. iPieces are a new generation of ‘board game’ that have been specially developed to combine traditional board games and the virtual world, to create a new way of playing games together. The specially designed playing iPieces and additional accessories (with selected packs) have been uniquely developed to interact directly with the iPad and the player. iPieces bring games to life in a three-dimensional way that has not been previously seen on iPads, and when used in combination with the newly developed games from Jumbo, the iPieces will bring the games to life on screen right in front of your eyes with amazing animations and fun sound effects. The iPieces playing pieces are made of a strong and durable abrasion-resistant material. iPieces do not scratch the screens of iPads when they are used correctly.